Canaloplasty is a new treatment for glaucoma that surgically manages glaucoma. It is proven to safely lower intraocular pressure (IOP) and dependence on medications. Unlike traditional procedures, Canaloplasty is minimally invasive and has fewer complications. Canaloplasty reduces the intraocular pressure (IOP) thereby controlling the disease. It effectively revitalizes the drainage mechanism of the eye or the aqueous outflow. It provides a better safety profile with respect to complications both during and after surgery as compared to traditional glaucoma surgery. Canaloplasty uses a microcatheter to canulate the trabecular meshwork which is the drainage system of the eye. 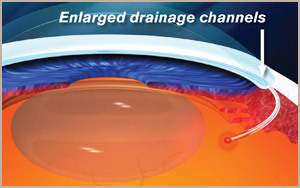 A gel-like material is then injected in the eye drainage channel to help enlarge it. A suture is then passed through it to make sure that the channel stays enlarged and open. This has the overall effect of lowering the pressure drastically and controlling the disease. Patients with this procedure will be able to eliminate medications in most cases, including the side effects and costs of medications, while achieving excellent control of their disease.